Home » Was the Miracle of the Sun a UFO sighting? Was the Miracle of the Sun a UFO sighting? 99 years ago something happened to three shepherd children in the town of Fátima, Portugal. What became know has the Miracle of The Sun is maybe one of the most important UFO (and maybe alien) sightings in Europe’s history. Starting on May 1, 1917, the children began to describe seeing a woman “brighter than the sun, shedding rays of light clearer and stronger than a crystal ball, pierced by the burning rays of the sun.” The being was reported to have appeared to the children on the 13th day of six consecutive months in 1917, starting on May 13. According to ten year old Lúcia Santo, in the course of her encounters, the woman confided to the children three secrets, now known as the Three Secrets of Fátima. 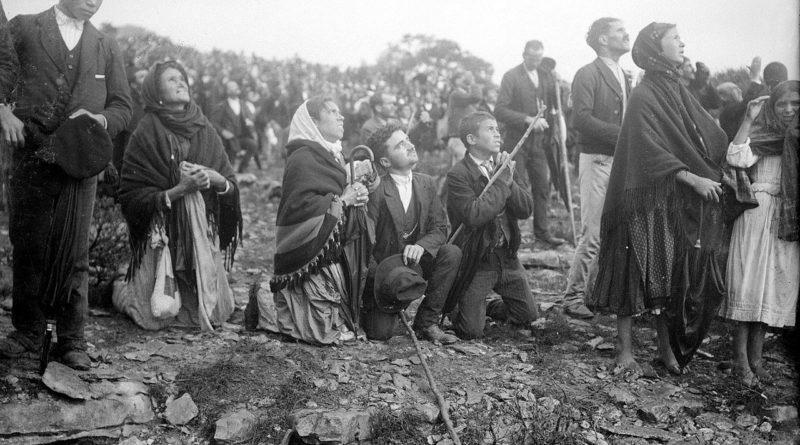 On October 13, 1917, the Miracle of the Sun was witnessed and reported by 50,000 to 100,000 people in the Cova da Iria fields near Fátima, Portugal. The people in attendance had assembled to observe the publicized event. According to many statements, the best known from a respected scholar, after a downfall of rain, the dark clouds broke and the sun appeared as an opaque, spinning disc in the sky. Crowd looking at the sun during the event. The sun was then reported to have careened towards the earth in a zigzag pattern, frightening some of those present who thought it meant the end of the world. Some witnesses reported that their previously wet clothes became “suddenly and completely dry.” Estimates of the number of witnesses range from 30,000-40,000 by Avelino de Almeida, writing for the Portuguese newspaper O Século, to 100,000, estimated by Dr. Joseph Garrett, professor of natural sciences at the University of Coimbra, both of whom were present that day. Was it really the Sun? Or a UFO? And who was the mysterious figure now known has Fátima? The event was officially accepted as a miracle by the Roman Catholic Church on 13 October 1930.